Copper and base metals markets are having terrible week, but the rally in the price of cobalt shows no signs of fizzling out. The metal quoted on the LME rose to a fresh 9-year peak of $81,500 a tonne yesterday, a 147% surge since the beginning of 2017. "The aim is to secure the supply all the way down to the level of the mine, for 10 years. The contracts are ready to be signed." On Friday luxury vehicle maker BMW said it's close to signing a 10-year supply contract for lithium and cobalt according to a report in Germany's Frankfurter Allgemeine Zeitung quoted by Reuters. Markus Duesmann, purchasing executive for the German marque, said "the aim is to secure the supply all the way down to the level of the mine, for 10 years. The contracts are ready to be signed." BMW recently said it believes its needs for car-battery raw materials will grow 10-fold by 2025 and that it had been surprised by "just how quickly demand will accelerate". 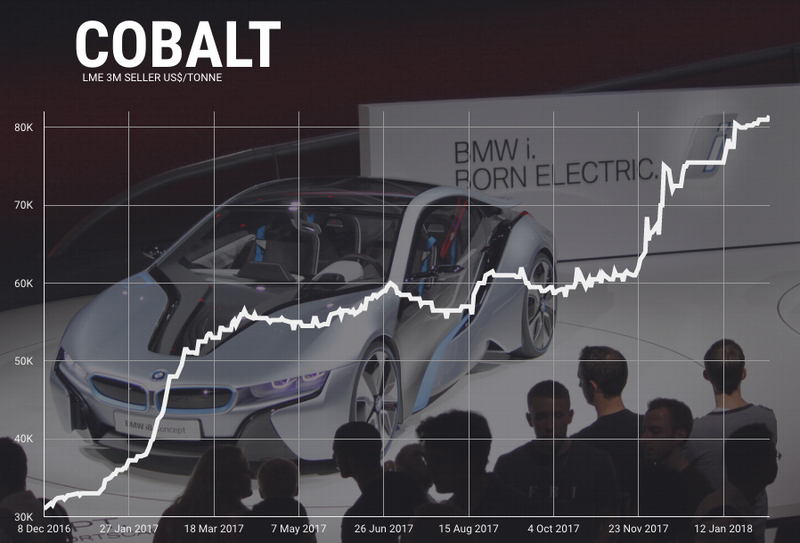 BMW plans to offer 25 electrified vehicles by 2025 and like many of its peers prefer the use of nickel-manganese-cobalt batteries (EV pioneer Tesla's favoured battery technology uses less cobalt). Traditional carmakers are scrambling to retool their businesses for the electric vehicle market. In January Ford said it's doubling its investment in the sector to $11 billion over the next five years. French carmaker Peugeot said it’s returning to North America with an entire fleet of electrified vehicles by 2025 while Volkswagen is targeting a 300-model battery-powered lineup by 2030.